When it comes to social media growth, most brands these days are focusing on Instagram. This platform has over one billion users and 80% of those users follow brands. Instagram is a great platform for increasing the awareness and recognition of your company or personal brand. With popularity on Instagram being so important these days, many people are looking for ways to fast track their audience growth. This is why automation tools are so popular. These days, there are many Instagram automation tools to choose from. It can be difficult to know which ones are the safest and most effective. 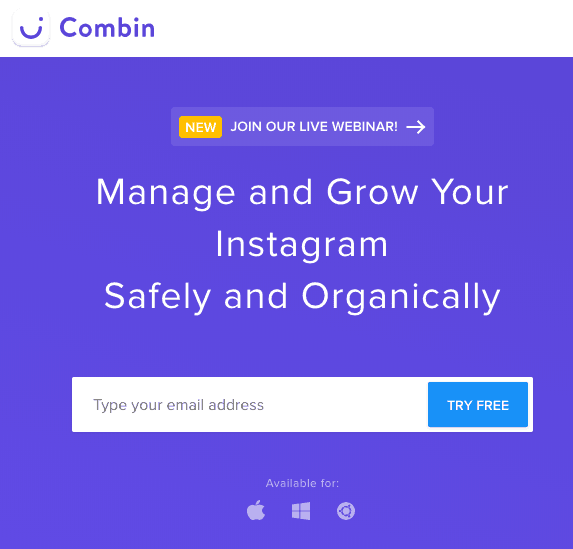 One of the most popular automation tools available right now is Combin for Instagram. This tool promises to “skyrocket” your brand’s growth on Instagram. This tool promises to help you gain real followers, likes, and comments. It also promises to help you connect with influencers and engage with your audience more easily. Since the use of many Instagram automation tools comes with a risk, you may be wondering whether using this tool is safe. In this Combin review, I’ll fill you in on Combin’s key features, pricing options, and its pros and cons. I’ll also give you my final thoughts on whether or not this tool is safe to use. Combin is an automation tool that promises to help you gain real followers and engagement for your Instagram account. According to Combin’s website, this tool doesn’t grow your account by gathering temporary likes and follow-backs. This is important because this type of growth can trigger Instagram’s detection tools. If this happens, Instagram may disable or even ban your account. Combin works by using a search tool. This allows you to search for posts that contain hashtags and locations that are relevant to your brand. From there, you can select specific posts to like and comment on. You can also choose to follow users from this search. To use this automation tool, you have to download the program onto your computer. The software is compatible with Mac, Linux, and Windows operating systems. 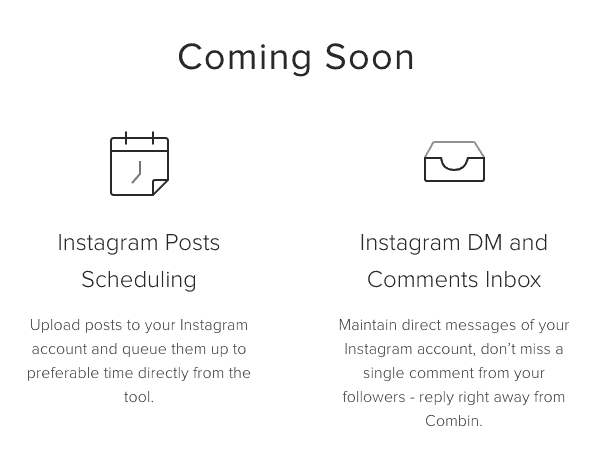 To get started with using Combin for Instagram, you must subscribe to their email list. This Instagram automation tool has a variety of features that help you to connect with your target audience. The advanced Instagram search feature allows you to locate users and posts that are relevant to your niche and target audience. You can interact with these users and posts in order to encourage engagement with your account. This tool allows you to search by hashtag, location, and mutual followers. You can also use this tool to find and interact with users who follow and engage with your competitors. You can also perform multi-faceted searches by combining two or more factors. For example, you can search for users who are using certain hashtags in your city. You can also search for people near you that are interacting with your competitors. It’s location search feature also includes an interactive map. This map enables you to accurately pinpoint the locations you want to target. Combin also has a feature that allows you to manage your audience. With the audience management feature, you can manage your followers and the accounts you follow in one tab. This tool allows you to discover accounts that you are following that aren’t following you back. You can use this feature to unfollow non-followers in batch. The audience management feature can also keep track of any accounts that you have unfollowed so that you won’t end up following them again. You can also schedule actions to perform for groups of followers and followings. This feature allows you to analyze your searches and select the best accounts to interact with. You can choose to only interact with users who are likely to return the engagement. With the user search analysis feature you can skip celebrity, major brand, and spam accounts. These types of accounts are all less likely to follow and interact with your brand. The user search analysis feature uses a machine learning-enhanced algorithm. This algorithm analyzes accounts with 90% accuracy. This feature allows you to maintain control over which accounts you follow and which posts you want to interact with. Combin is pretty much a manual tool so it won’t perform any action on your behalf without your permission. The sorting & preview tool lets you view previews of posts and accounts before interacting with them. You can also sort by date and popularity so you won’t have to worry about following and interacting with inactive accounts. The last key feature that Combin includes is the ability to monitor the likes, comments, and follows that you receive through the app. With the activity statistics feature, you can keep track of your growth, and the number of followers, likes, and comments you receive. This is very useful for tracking your growth and making sure Combin is working effectively. In my opinion, although Combin’s pricing isn’t too bad, you don’t get many features for the price. There are other automation tools available that have more features and enable you to connect more accounts for a similar price. I’ll start with the positive aspects of using Combin for Instagram. One thing that I like about this application is the fact that it’s easy to communicate with other users through the program. You can participate in discussions under posts you interact with right in the app. Combin also allows you to leave more than one comment at a time and create comment templates. You can also schedule comments and likes for groups of users. This function is definitely a time-saver. Once you’ve downloaded the program, it’s pretty easy to set up and use. It’s also a good thing that their site has an “https” URL, which means that it’s secure. This means that your information is safe and protected on the site. They also have verified payment gateways that protect your credit card information. When you download the program onto your computer, you’ll have to enter the credentials for your Instagram account. The application uses two-step authentication, and it doesn’t store or share your login information. Another thing that I like about Combin is its FAQ and help page. It’s very detailed, and you can find answers to many of the questions you may have before signing up. You can also find contact information to reach out to Combin for additional help. Now on to the negative aspects of using Combin for Instagram. The first disadvantage of this tool is that you have to download software to use it. I strongly prefer automation tools that you can use in a web browser. Although Combin has a variety of security features in place, I felt nervous about downloading the software. I’m always wary of downloading programs for applications that aren’t made trusted companies. There’s always a risk of downloading a virus onto your machine. I also don’t like having to use up disk space for programs like this. Another inconvenient aspect of this tool is the fact that you have to join their email list in order to try it out. Most people don’t like receiving promotional emails, especially for a program that they’re just trying out. It would make more sense to have users join their email list once they’ve tried and liked Combin and committed to a paid plan. Although their FAQ and help page has a great deal of information and plenty of contact information available, they don’t offer 24/7 phone or chat support like other automation tools. This is pretty inconvenient if you live in an opposite time zone to their customer service team. It’s also inconvenient if you have a specific question about your account that you need a fast answer to. Another red flag of this program for me is the lack of real reviews on their website. When I’m investigating an automation tool, I like to be able to read reviews from satisfied users. This gives me an idea of the safety and efficiency of the program. I like to be able to see if users are experiencing growth. I also like to make sure the tool isn’t getting users’ accounts shut down. If you’re looking for an Instagram growth tool that saves you time, then Combin may not be a good option for you. This tool is highly manual so you will have to perform a lot of the tasks on your own in the program. 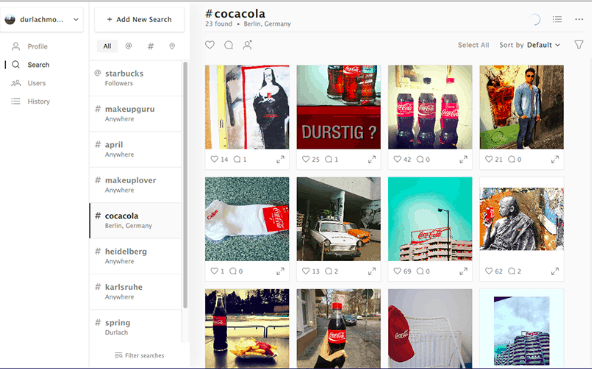 Many of the tools included, like searching by hashtag or location, can be done manually from your Instagram account. One of the most basic features that Combin is missing is post scheduling. The website lists this feature as “coming soon.” As I said earlier, if you’re looking for a growth tool that will save you time, then Combin is probably not ideal for you. The ability to schedule your posts for key times is a feature that I expect to have with an automation tool. With Combin, you also cannot (yet) manage your comments and direct messages from the program. Their website states that this feature is also “coming soon,” but there are many similar tools that already offer this function. If you’re looking for a safe Instagram automation tool that will also save time, I’d recommend KENJI.AI. This is a machine-learned automation tool that is powered by artificial intelligence. This tool can perform tasks naturally and effectively 24 hours a day. I like that you can use it in a web browser and on multiple devices like your phone or tablet. I also like that KENJI has been used by several reputable companies like Inc., Yahoo! Japan, and HuffPost. 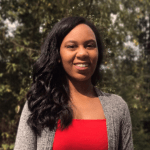 The Final Verdict: Should You Use Combin for Instagram? Although Combin has quite a few positive aspects, I wouldn’t recommend it. With so many other similarly priced automation tools that come with more features, I don’t think Combin is worth it. There’s really nothing special about this application, and it using it seems to require a lot of time. The fact that this tool has so many features that its website lists as “coming soon” makes me think that it’s still in development. If you’re interested in Combin, I’d suggest waiting until there are a few more reviews on their website just to be safe. This tool isn’t worth the risk of having your account disabled or banned.